big, Big, BIG episode this week. 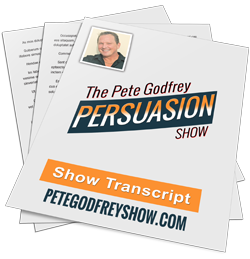 Pete and I talk about the two major fears that sabotage success and how to banish them from your life forever. As persuaders, we can’t afford to be afflicted with these two fears. Many people have got them. Both Pete and I have lived with these fears at one point or another. But to persuade at the top level requires confidence. These fears are like leeches. Just sucking away your confidence at every turn. And in this week’s show we’ll show you exactly HOW to get rid of them.